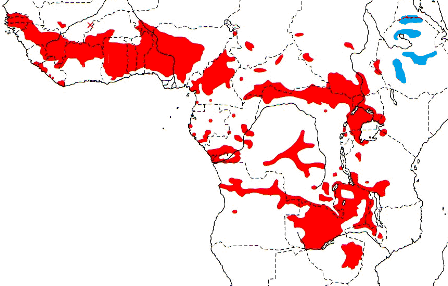 The Yellow-mantled Widowbird Euplectes macroura is widespread in African grasslands. The breeding male (photo right, by photographer Mike Buckham) is black with a yellow mantle and wing shoulder, and a long rounded tail. 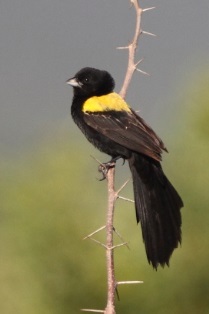 In Ethiopia, the yellow is only on the shoulder, but the similar yellow-shouldered subspecies of the White-winged Widowbird does not occur there. The Yellow Bishop male differs from the Yellow-mantled Widowbird in having a shorter tail, yellow rump and black mantle. The non-breeding Yellow-mantled Widowbird male has small yellow shoulder patches, and a longer tail than bishops in similar plumage. 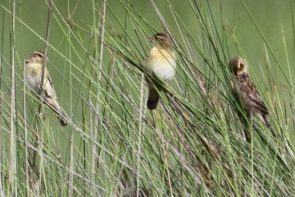 The female Yellow-mantled Widowbird does not have yellow shoulder patches but has yellow margins to the lesser and median coverts. The Yellow-mantled Widowbird inhabits moist grassland, and marshy areas with trees and scrub. It also occurs in rice fields and rank grass in abandoned farmlands. It roosts in reeds or papyrus in swamps, or in thickets. The Yellow-mantled Widowbird feeds mainly on seeds, especially of sedges, and also grass seeds. It also feeds on arthropods, including termites and their alates. The diet of adults is about 80% seeds and 20% arthropods. The Yellow-mantled Widowbird forages on the ground and in low vegetation, while termite alates are hawked in the air. It joins mixed-species flocks in the non-breeding season. The Yellow-mantled Widowbird is polygynous, with up to five females per male. It is territorial, but in areas of high density it appears to be colonial. The male pursues females in flight, with his tail depressed in display. Experiments showed that male tail length affects territory defence, but not the attractiveness of the male to females. There are no PHOWN records for the Yellow-mantled Widowbird (see PHOWN summary), and many are needed of this widespread species. Also look at old nests which may be taken over by Zebra Waxbills Amandava subflava. Submit any weaver nest records to PHOWN (PHOtos of Weaver Nests) via the Virtual Museum upload site.